The exclusive Cricut Circle Animal Antics cartridge offers a whole lot of goodness. Including a saxophone playing alligator with a beret. 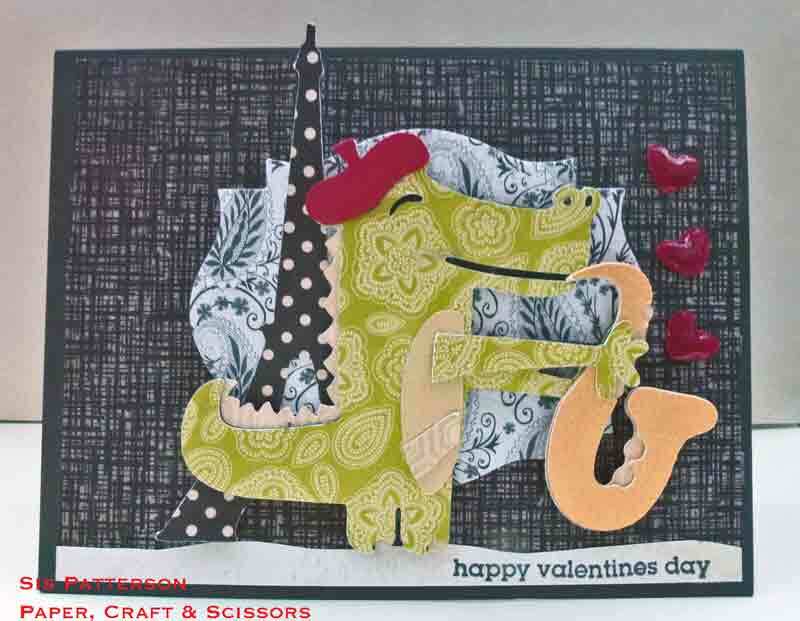 Loved it – and love the fun and whimsical things one can do using one cut to inspire the remainder of a card. I cut the gator at 3″ tall and the Eiffel Tower is from Every Day Pop Up at 3.75″ tall. 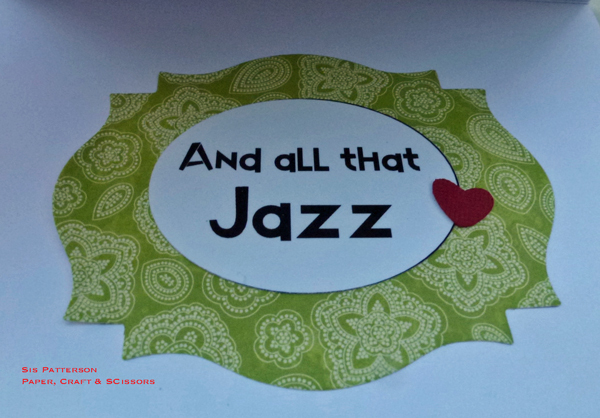 I replaced the musical notes with hearts (with Glossy Accents) from the Cricut Craft Room Basics. The hearts measure .35″ tall. I trimmed the snowy base at .5″ wide and used scissors to add the wavy hills. The stamp “happy valentines day” is from Avocado Arts. The black and white patterned paper used Spellbinders Labels Nine Nestabilities die. The Eiffel Tower and the gator are adhered to the label. The label is attached to the card via an Action Wobble spring. The background paper is from Basic Grey and it is cut at 5.25″ by 4″. The A2 card is from Memory Box (in Licorice). The inside of the card is also a Spellbinders Label Nine and the sentiment uses Lettering Delight’s Sundae font. I used Silhouette’s Print and Cut feature to make the sentiment and added a heart from the Cricut Craft Room Basics. The Animal Antics file included a similar phrase but I preferred the sentiment to be printed rather than cut. That is sooooooooooooooo cute! Looking forward to getting that cart in the mail 😀 . I love how you made it especially for Valentine’s Day. He made me smile. I can’t wait for the cart either. That is adorable!! Love your use of patterned paper. I haven’t checked out Animal Antics, but I now I know I NEED to!! This card is very cute. It reminds me of earlier days when boys and girls exchanged valentines day cards as a way to tell everyone they were loved. I really love the gator blowing hearts instead of musical notes. As always, I love your choice of paper colors and texture. Let’s just say, I bet anyone receiving this card will find they have a smile in their heart. This card makes me smile! How fun!! Your little Parisian musician is so sweet. Love the details like the Eiffel Tower and replaced hearts— and those hearts look awesome with the Glossy Accents. They look like candy! As always, I love that you use great patterned paper to make your project sing. I am getting excited about the new cart…. and now I need to go make Valentine cards! Love the pattern paper and especially the little “candy” heart notes. They DO look edible. Wonderful card and I’m sure your recipient will adore it! Whimsical! My favorite style….lol. Absolutely fun, my friend. Love the beret and the pretty patterned paper you used for “ze alligator”. Did that sound French? 🙂 Adorable!